The 2018 Gold Coast Commonwealth Games will go down in history — with a new “shrine” to commemorate the event. The Gold Coast Sporting Hall of Fame in Southport is adding a major space to its collection dedicated solely to the Commonwealth Games. The first batch of memorabilia was delivered to the site yesterday, including volunteer uniforms, a Borobi doll, photos, novelty-size tickets, the iconic Games promotional surfboard, pins and more. 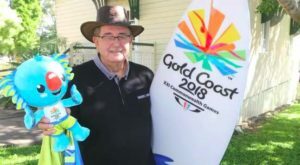 “All those things are of interest, what we’re trying to create is a legacy,” Gold Coast Sporting Hall of Fame Secretary Paul Stevens said. “The Hall of Fame houses a good range of sporting memorabilia used by elite Gold Coast sports people, but it also houses things like honour boards, and local award recipients. “The other memorabilia in the general hall is made up largely of athlete donations, we’re not an organisation that goes out and buys material. Founding president of the Hall, Daphne Pirie said it’s hoped the tribute space will be a huge coup for the hall, sporting community and wider city. “We have been preparing and buying showcases so we can suitably display anything we can get from the Commonwealth Games,” she said. The shrine will be in the old Gold Coast Bulletin building, which is contained within the Hall’s grounds. “I don’t think there was a hesitation at all from the Bulletin in saying that sounds like a reasonable outcome, let’s go for it,” Mr Stevens said. A group of hall volunteers will spend Saturday getting the tribute space ready for opening “in the near future”. “I don’t think anyone would be involved if they didn’t think it was particularly important to not only exhibit the memorabilia from these sorts of events, but to honour and reward the sports men and women that bring it all about,” Mr Stevens said. “The Games display was just an automatic progression from, firstly, the Games being on the Coast. “ … and two, we’re in the business and it seemed like a natural thing that what we should do is mount a Commonwealth Games display.